Want to do some holiday stitching, but you're running out of time? These miniature patterns are perfect for last-minute embroidery! In fact, you'll be able to embroider a gingerbread cookie, snowman or one of the other designs while you watch your favorite Christmas movie. Small patterns like this are fast and easy, but they're also just the right size for making ornaments. Use a 3-inch embroidery hoop and frame the finished embroidery in it. Then, add a ribbon hanger tied to the hoop's hardware. Or, construct an ornament that has a bit of stuffing or a cardboard insert. These miniature motifs are also good for adding to the corner of cloth napkins, handmade (or readymade) zip pouches, coasters and more. If you have a child that enjoys embroidery, they're sure to love these patterns too. To make it easier for them to stitch, enlarge the designs slightly so they don't have to worry about tiny details as much. 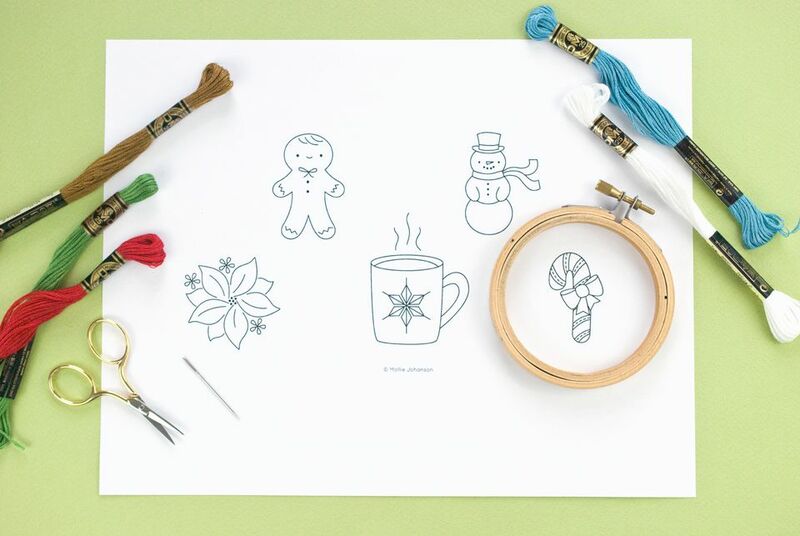 Now, pour yourself a mug of hot chocolate and get ready to stitch! Download the Holiday mini patterns and print them out. Use a "fit to page" printer setting to keep these motifs small, and they should fit within a 3-inch embroidery hoop. Or resize the designs as you like. Transfer the patterns using your favorite method. With each of these designs, the colors are entirely up to you, because there's plenty of room for flexibility. There are a few ideas for each motif below, but another option for all of them would be to stitch them as redwork embroidery, either in red or another color. On the gingerbread cookie, select a main color that resembles your favorite cookie recipe. It could be dark brown, light tan or something in between. Then find a few frosting colors. If you want to stitch the snowman in white, be sure to work on a fabric that will give the embroidery floss some contrast. Or, use a light blue for the snow so you can see your snowman on a white background. We often think of poinsettias as red, but they come in a range of colors, and your embroidery can too. From ivory to pink to red to burgundy, stitched winter flowers can be as colorful as the real thing. Embroider the mug in whatever colors you'd want a holiday mug to be! Maybe it's aqua and white, red and green or white and gold. Be creative! Once again, candy canes don't have to be only red and white. They can be pink and white, green and white or even a rainbow. Use simple stitches and two or three strands of floss for these miniature designs. Back stitch or stem stitch work well for the outlining. Use french knots or colonial knots for the dots and single detached chain stitch for the tiny flowers around the poinsettia. Just as the patterns themselves are small, your stitches should also be small. This will help keep details clear. Enjoy stitching as you celebrate the season!